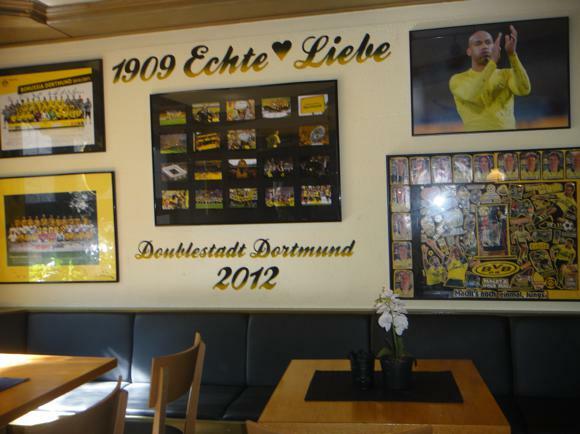 Dortmund is built on beer and football. 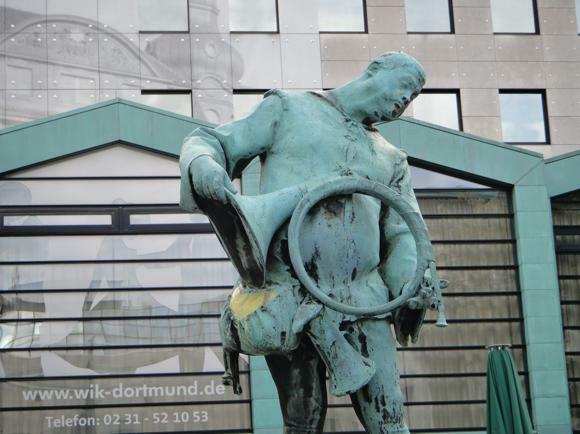 Set in Germany’s industrial Ruhrgebiet, around a compact and pedestrianised centre, Dortmund is very much a one-club city – and that one club, Borussia, attract the highest average attendance in the European game. 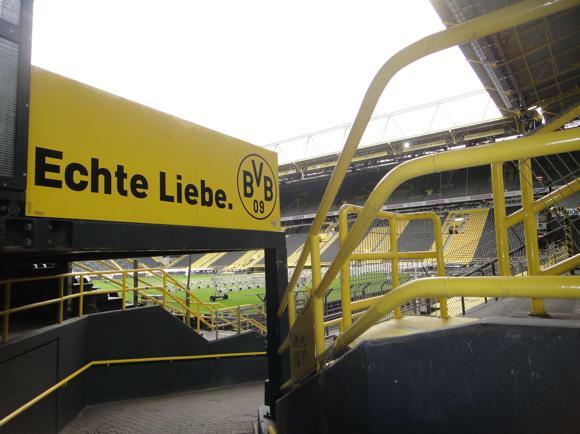 Dortmund’s standing terrace of 24,454 in the Südtribüne of the Signal Iduna Park forms the Gelbe Wand, the famed Yellow Wall, football’s largest Kop. But it’s not just the numbers. This is mass support with equally massive yet sensible beer consumption, this is ticket prices kept at reasonably affordable levels, this is public transport included with your match ticket, this is an entertaining, imaginative and informative stadium tour, this is the main square of a city surrounded by bars yet fun and orderly, this is a scheme to offer hotel packages as part of a Bundesliga weekend, this is one huge, lucrative and successful industry built on the twin pillars of beer and football. And this, pretty much, is why around 1,000 match-day Brits choose Dortmund for their Saturday football fix. Many are also happy to take in a game nearby, too. 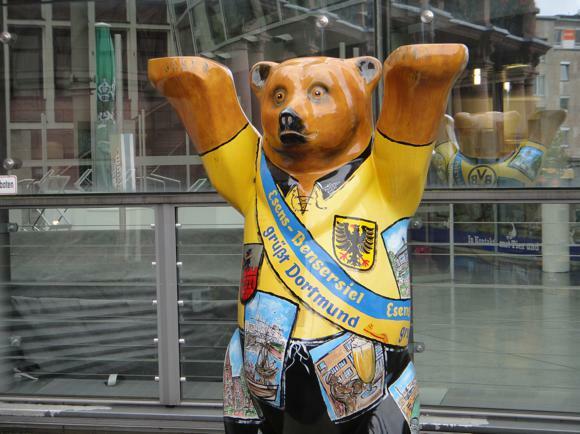 Borussia’s eternal rivals in the Revierderby, Schalke, are from Gelsenkirchen, one of several clubs linked to Dortmund by a regional light-rail network. Others in the Zweite and below include Rot-Weiss Essen, Arminia Bielefeld, VfL Bochum and MSV Duisburg. All have long histories, large fan bases and the potential to challenge in the top flight. 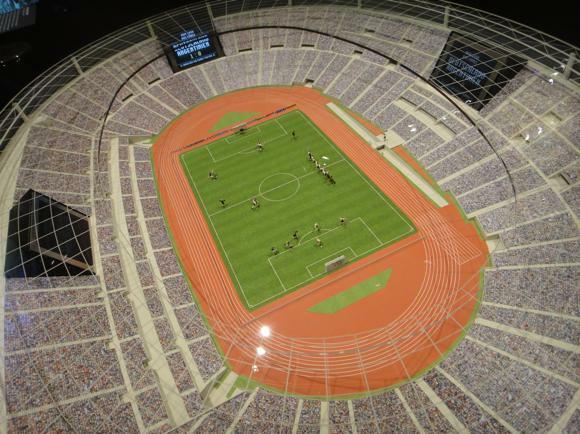 Essen, for example, German champions in 1955, play fourth-league football in their new 20,000-capacity arena. 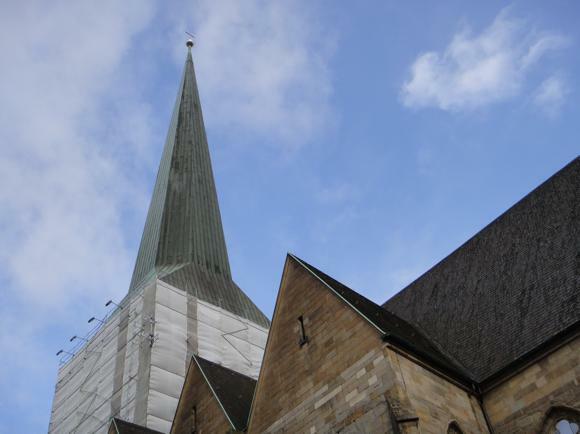 Borussia’s own reserve team, who recently played under currently successful Huddersfield manager David Wagner, attract low crowds to the old Stadion Rote Erde, Dortmund’s old ground towered over by the Signal Iduna Park. Opened in 1926, the Rote Erde had the roar, the din that drowned out Dortmund’s semi-final win over West Ham in the Cup-Winners’ Cup of 1966 – but also rickety wooden stands. 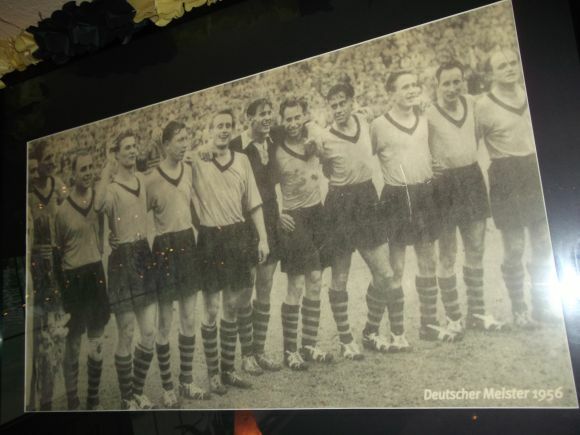 Over the course of nearly 50 years, Germany’s most passionate football city only staged two full internationals, a post-season friendly against Irish Free State in 1935 and the 6-0 whitewash of Euro debutants Albania in 1967. 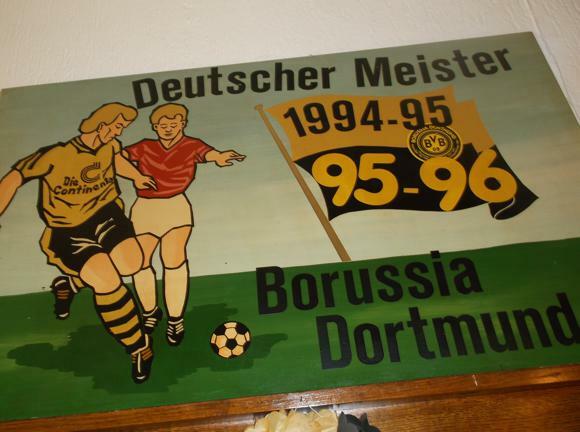 The rise of Dortmund as Germany’s prime football stage – arguably above national capital Berlin and silverware-laded Munich – dates back to the decision to choose it over Cologne as a 1974 World Cup host. Today’s Signal Iduna Park, the Westfalenstadion was built on an extremely tight budget, its regular tenants then wallowing in the Zweite Bundesliga. It proved a stroke of genius. Dortmund hosted four games, one involving Scotland, three Holland, and a collective 180,000 thirsty supporters went home satisfied – the Dutch heading for the final after an imperious display here against Brazil in the semi. 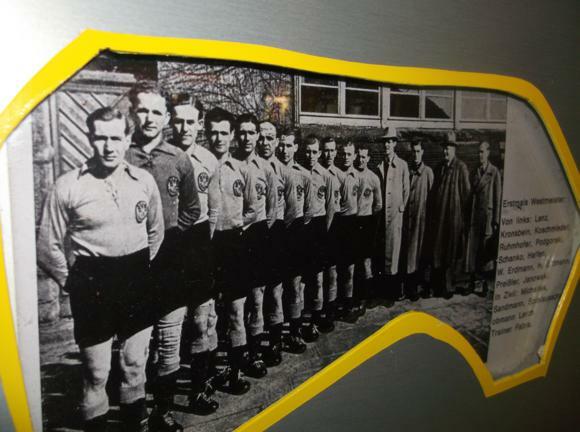 Whereas the Rote Erde was a Weimar-era facility integral to a sports complex of swimming pool, indoor hall and tennis courts (it still has a running track), the Westfalenstadion was conceived for football, four steep sides up close and personal to the pitch. And whereas Arsenal, say, have had a lucrative decade in the Champions League offset against the huge costs of building the Emirates, Borussia Dortmund were handed a ready-made goldmine of a stadium partly funded from state and municipal coffers. Ottmar Hitzfeld chipped in, of course, the coach masterminding Borussia’s 1990s’ revival, and first European honours since the Rote Erde roar of 1966. The Westfalenstadion was expanded, expanded again, then expanded yet again in order to fulfil FIFA requirements to stage another World Cup semi-final. 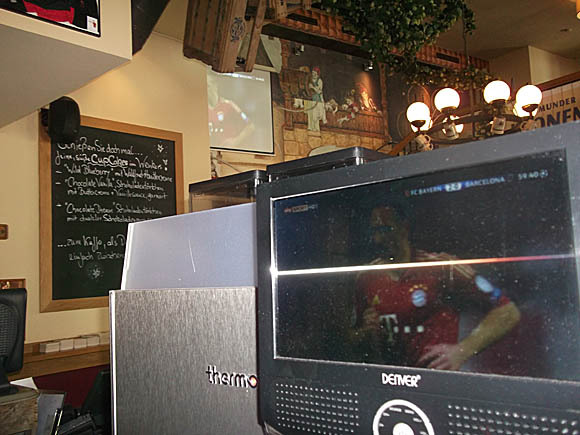 The most memorable moments of Sönke Wortmann’s wonderful fly-on-the-wall documentary of Germany’s 2006 World Cup, ‘Deutschland. Ein Sömmermärchen’, take place in the bowels of the Westfalenstadion, Jürgen Klinsmann’s players pumped up before taking on Poland or drained of all feeling after last-gasp defeat to Italy. 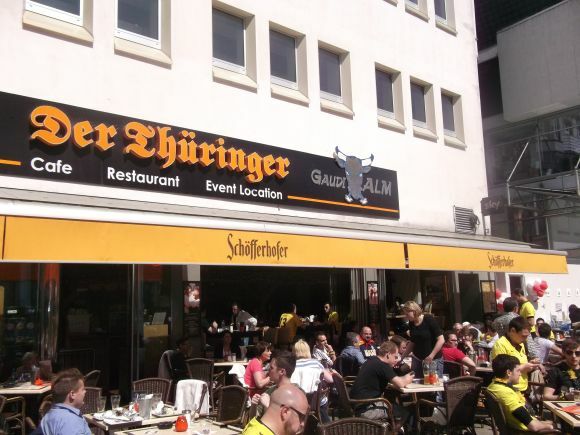 Germany’s profits from the 2006 tournament went towards the construction of another football institution – and again, Dortmund got the nod as hosts over Cologne. 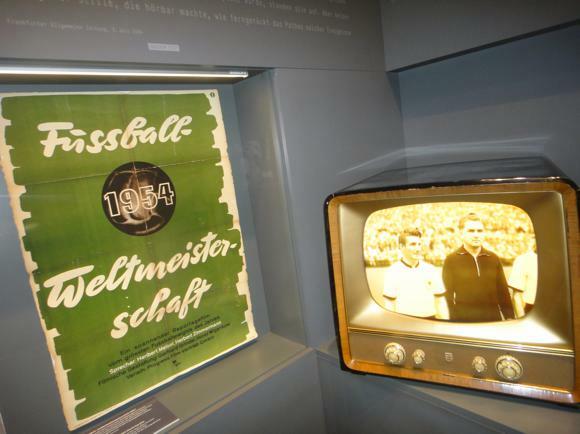 Opened in 2015, the German Football Museum sits opposite Dortmund’s main station, a worthy addition to any Dortmund visit. 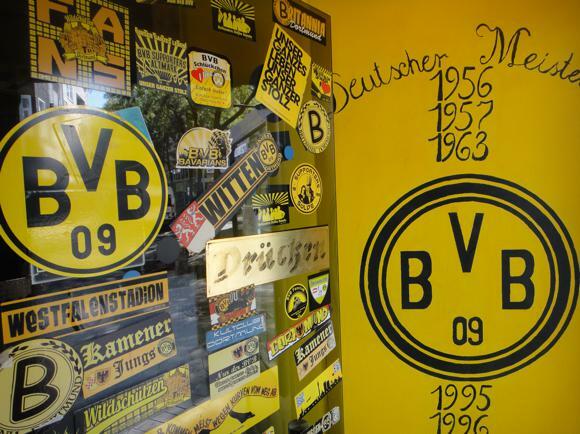 Throw in that stadium tour of the Signal Iduna Park, Borussia’s own Borusseum museum, the Yellow Wall and quality beer by the quartload, and Dortmund makes a convincing argument for it to be named Europe’s finest football destination. Dortmund airport is 10km (six miles) east of town. 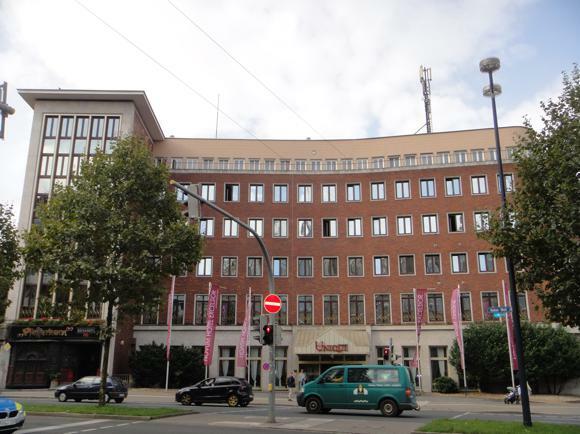 From the stop just outside Arrivals – veer right as you exit – Airport Express bus No.21 (€8.50, journey time 25 mins) runs on the hour to Dortmund Hauptbahnhof main station. Airport-bound from town, it’s on the half-hour. If you come out of the airport having just missed one, the AirportShutttle to nearby Holzwickede (5 min journey time) runs every 20min, every 30min Sat-Sun. 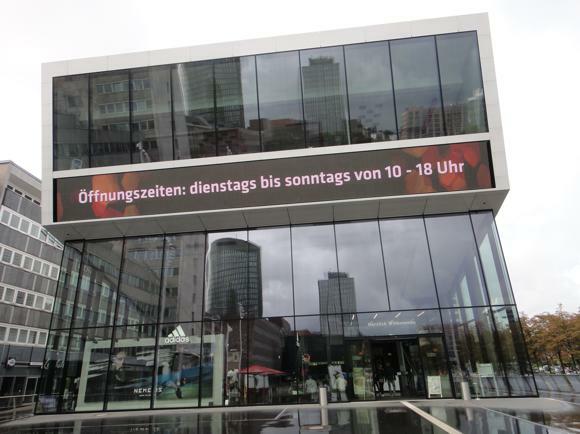 From there, a train runs every 20min to Dortmund, journey time 20min. A better alternative might be to take one of the people carriers that hover around the airport bus stop immediately after the Dortmund-bound bus is gone – the driver charges €7 per person (cash-only) and takes you to the main station quicker and cheaper than the next bus would be. 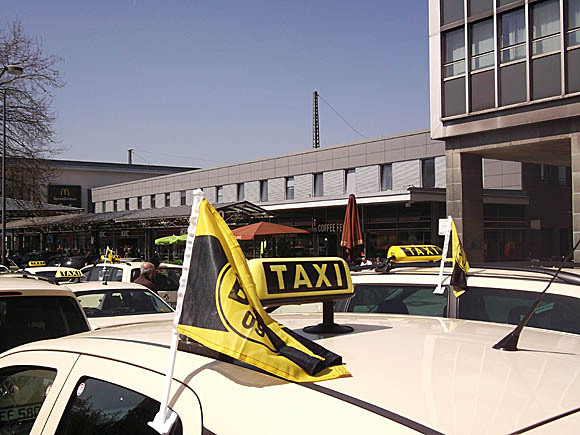 A taxi (+49 231 14 44 44) should cost €22-€25, either to the main station or the Borussia stadium. 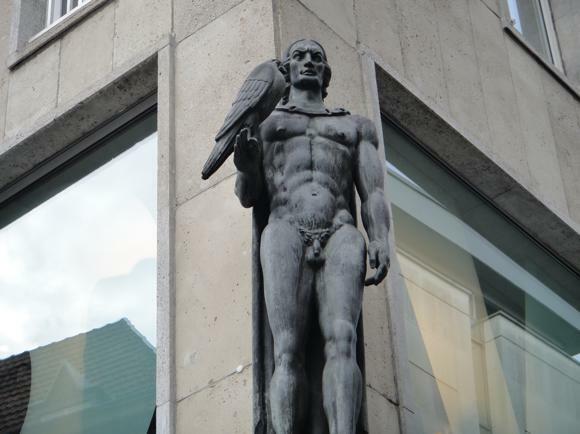 From the station, the pedestrianised city centre is a ten-minute walk. A light-rail network links the Rhine-Ruhr region with Dortmund, its station and the football stadium south of town. A single ticket (EinzelTicket) is €2.70, a day pass (Tagesticket) €6.80 from machines at stops and stations. Note that your ticket for the game is valid for transport on special match-day trains. 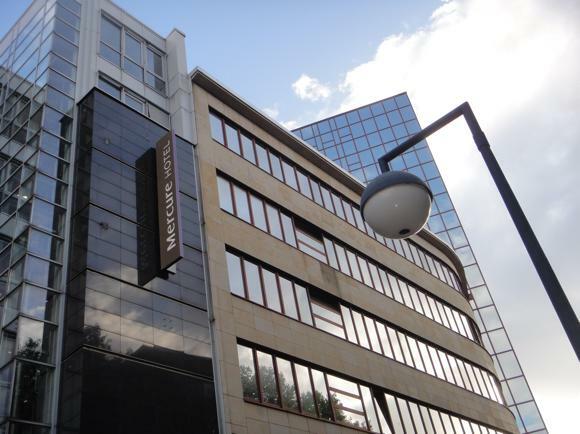 The tourist office has a hotel-booking service. 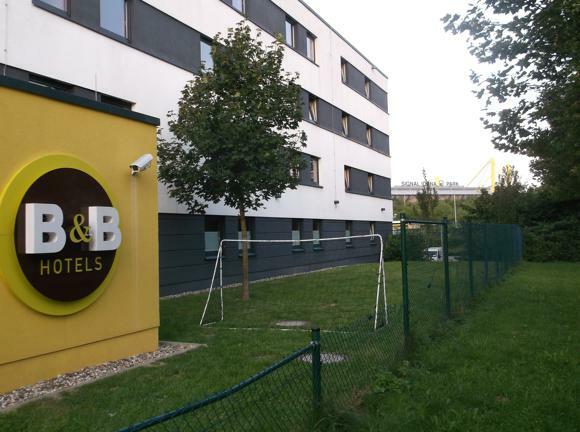 Borussia Dortmund also run a new scheme for weekend match packages, teaming up with generally upscale hotels, most within easy reach of the stadium. 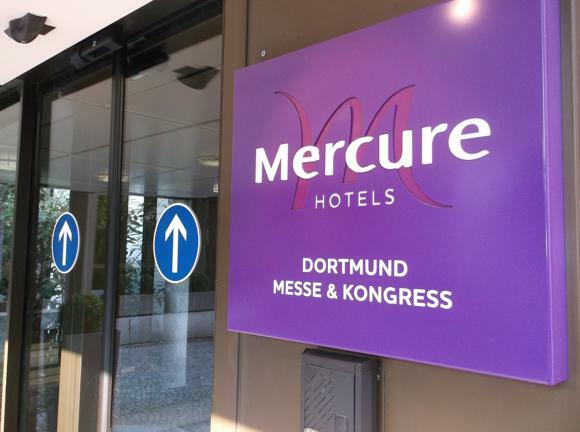 The closest hotel involved, just across the road, is the Mercure Hotel Dortmund Messe & Kongress, whose restaurants include the Rosenterrassen, provider of pre-match beers in its pretty rose garden. 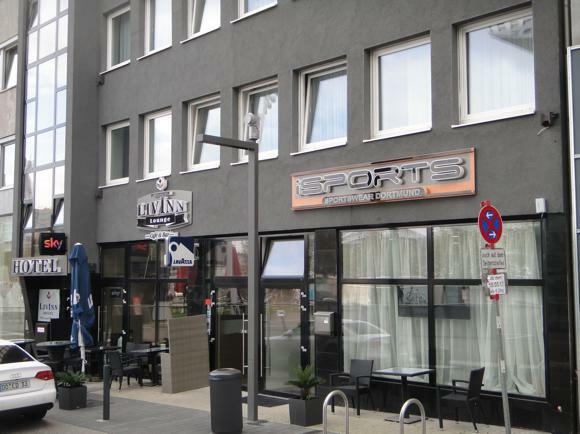 Another nearby lodging is the affordable B&B Hotel Dortmund-Messe, near Theodor Fliedner Heim U-Bahn station – note the football-themed breakfast room. 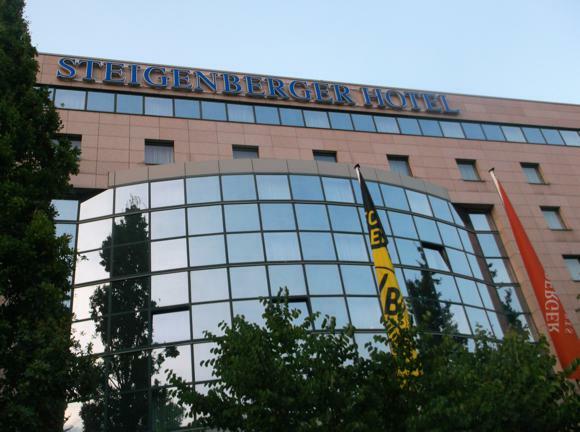 Also walking distance to the stadium are two upscale, business-friendly establishments: swish Steigenberger Hotel Dortmund and the business-oriented Dorint Hotel Dortmund an den Westfallenhalen, the former Pullman Dortmund. 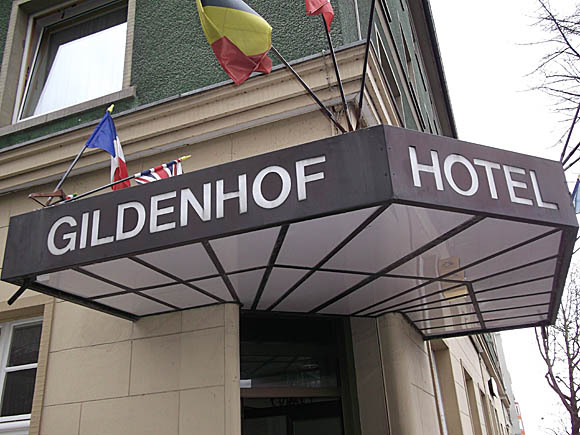 On Hohe Straße towards the stadium from town, the Gildenhof is homely. 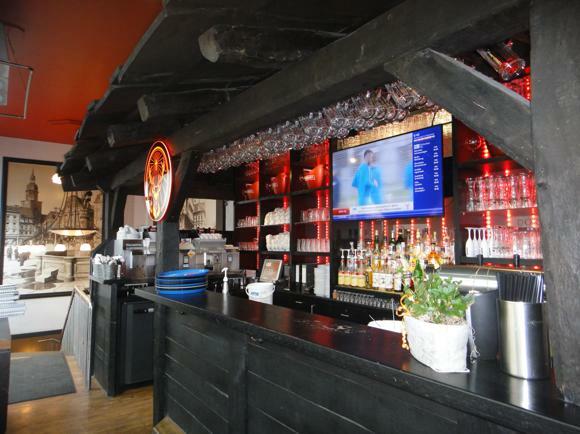 In town, youth hostel Adolph Kolping offers singles and doubles, while the Carlton (Lütge-Brückstraße 5-7, +49 231 52 80 30) is a long-established cheapie by a major BVB bar. 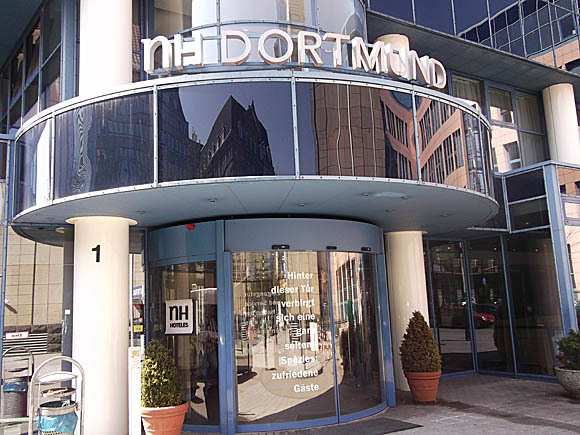 Right by the station, the four-star NH Dortmund is comfortable and convenient, while the nearby Hotel Königshof is a cheaper, recently renovated alternative. 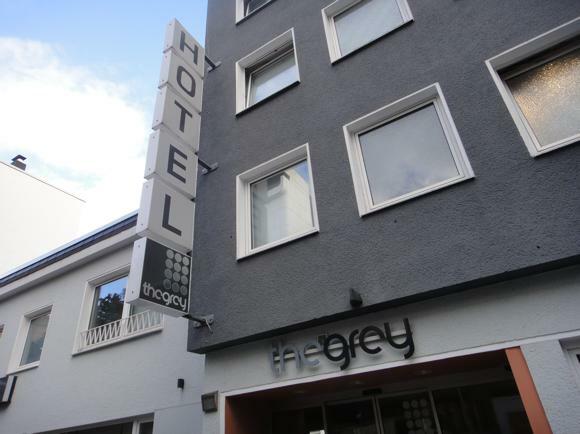 Also near the station, handy for the German Football Museum, contemporary mid-range The Grey sells itself as catering to visits of ‘Fussballhauptstadt Dortmund’. 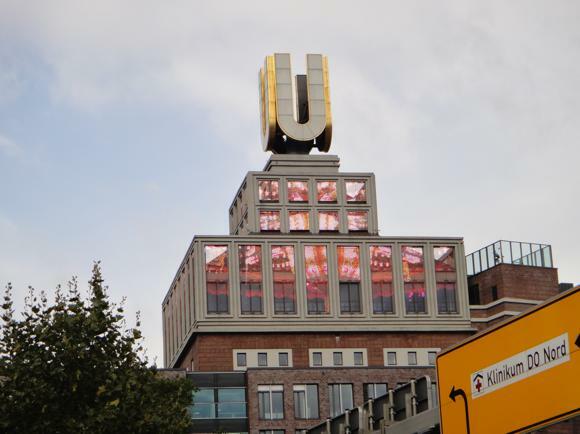 Also close, by Westerntor U-Bahn, the expansive Novum Unique is a functional four-star with 24-hour reception while regular three-star Hotel LivInn is literally next to the German Football Museum – and it has a sports bar with German Sky TV. 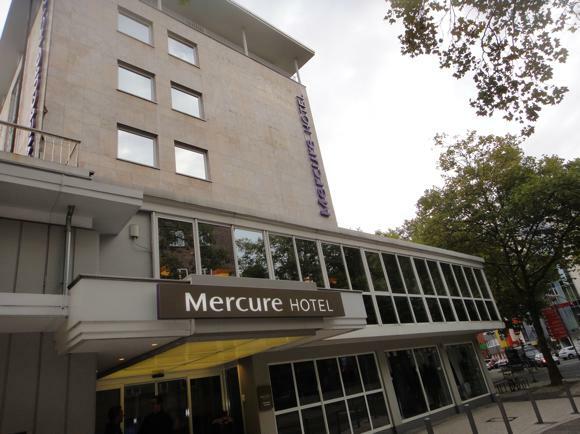 Affordable chains have set up shop around the town centre too, including two Mercures, the Dortmund City by Kampstraße U-Bahn and Dortmund Centrum tucked away a short walk from focal Markt. 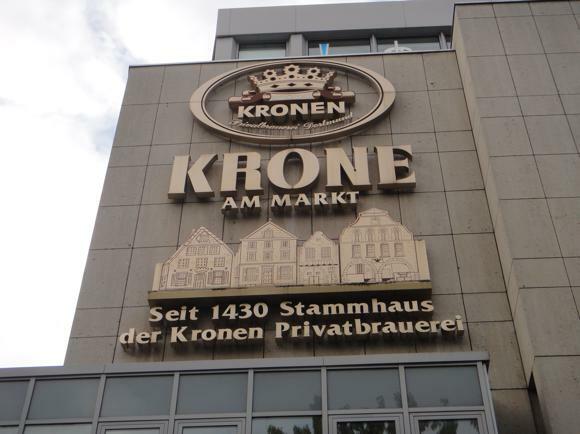 You’re in the beer capital of Germany – lap it up. 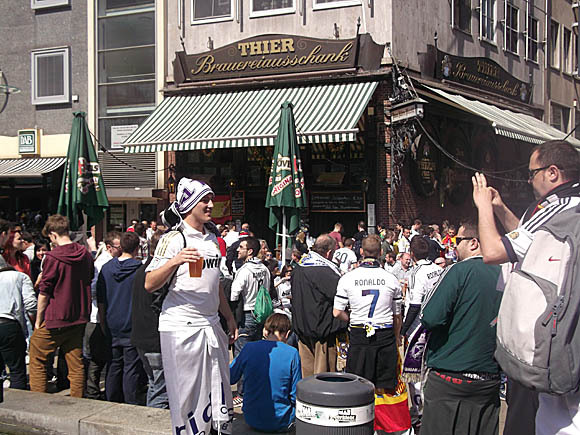 In the main square of Markt, the terraces of Brinkhoff’s No.1, Thier Brauerei’s Zum Alten Markt and Der Thüringer fill with fans. 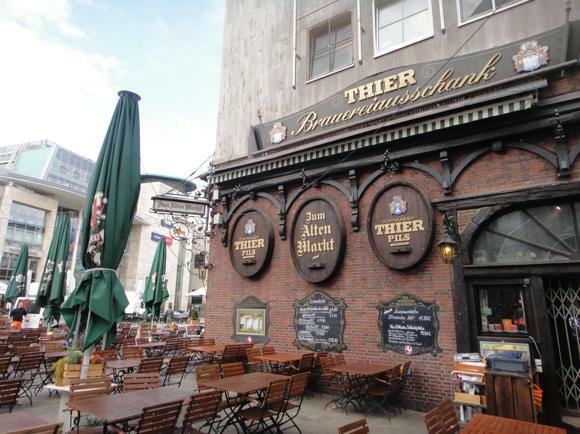 Der Thüringer is also convivial inside, with little alcoves and TV sport in every corner. Don’t be put off by the name or outwardly bland appearance of Wenkers. 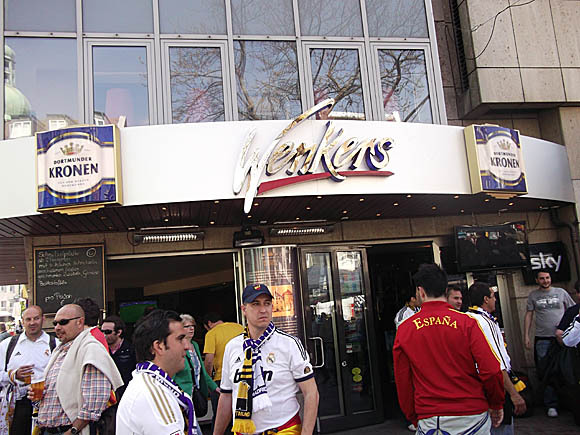 It’s the best and busiest pre-match bar, full of framed shirts and TV football, in the Krone Am Markt building by the BVB store. 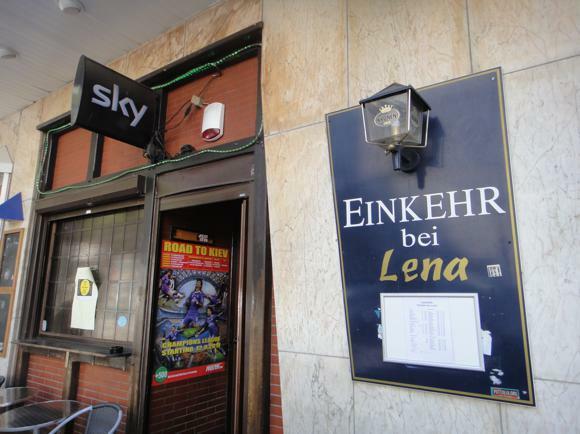 Einkehr bei Lena (Hansastraße 9-11) is a homely spot that goes big on TV football. 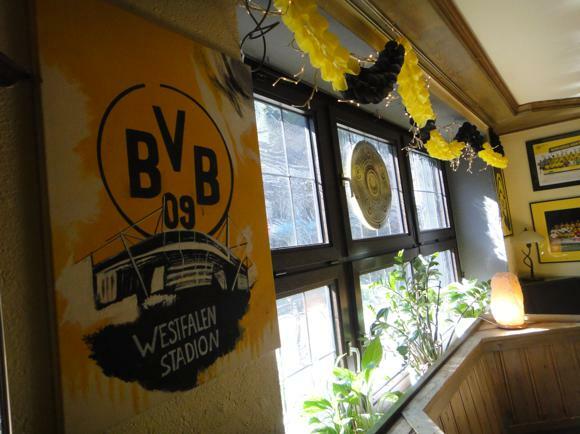 The stand-out local bar, though, is the Lütge Eck (Lütge Brückstraße 1) towards the station, a BVB haunt filled with memorabilia such as the 1956 championship line-up beneath a ceiling dotted with Borussia flags. 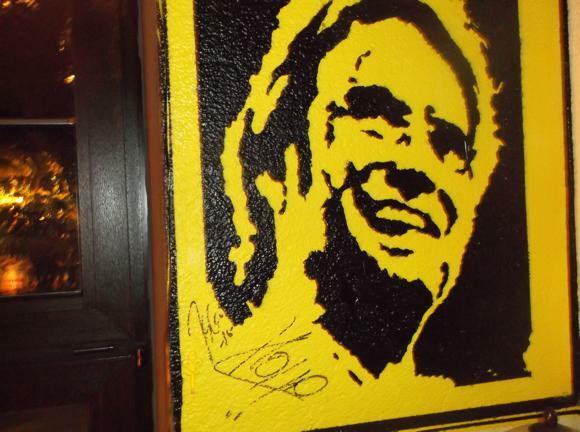 Jürgen Klopp has been a visitor, meeting fans and signing autographs. 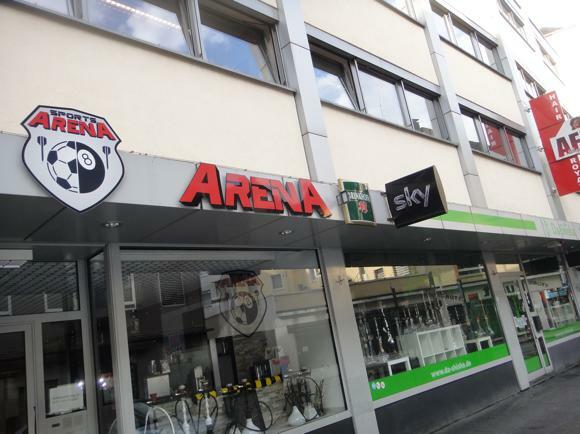 The nearby Sports Arena screens plenty of football and offers air hockey, pools and darts, but you have to bring your own atmosphere. 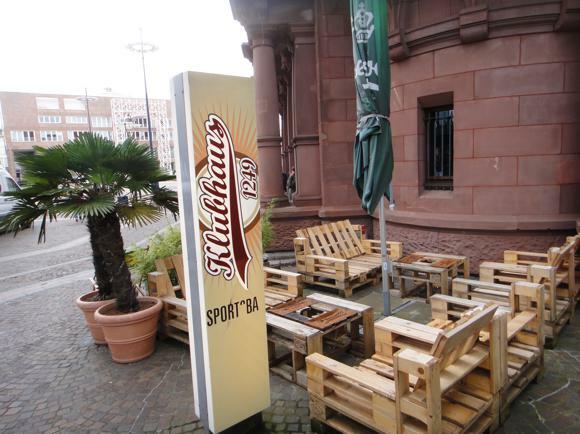 On the south side of the city centre, near Friedensplatz, Klubhaus 1249 is a major hang-out for football gawpers, with decent bar food and draught choices, too – it occupies an old building by a modest shopping centre. 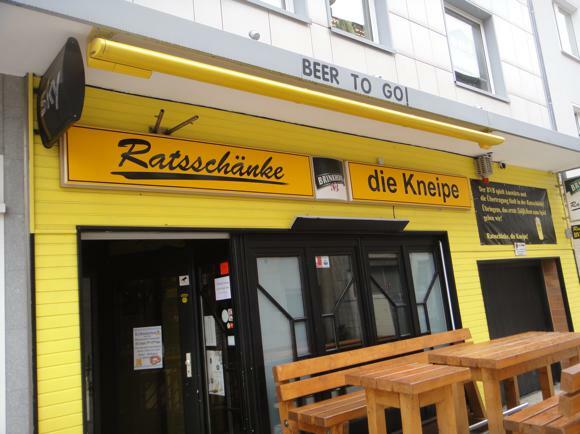 Nearby Ratsschänke down the sidestreet of Prinzenstraße feels a bit BVB by rote, but is by no means a bad bar at all. 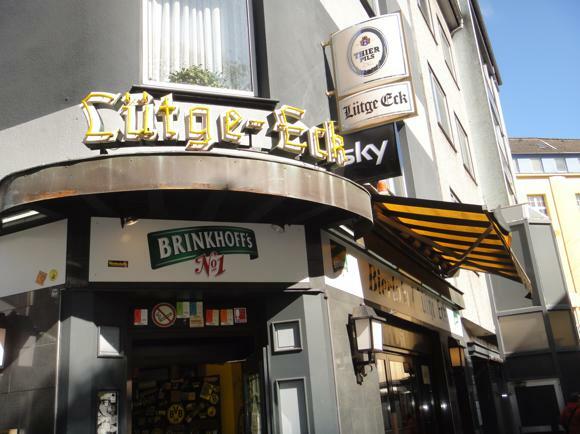 Around Borussia’s original stomping ground of Borsigplatz, with its own U-Bahn stop on the U44 line, cheap ethnic eateries have taken over the rond-point where the club was first founded. Otherwise standard betting bar Hat-Trick has had the good grace to erect a modest display of the club’s history in its front area. 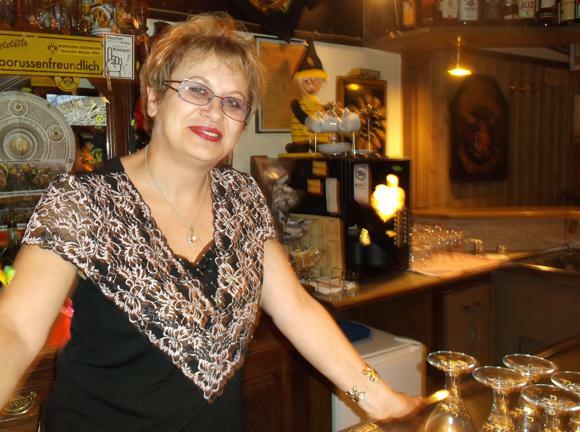 One stop nearer to town by Enscheder Straße, Actien-Becher is a classic old BVB bar barely changed since the Stan Libuda era – a change of management in 2017 has gallantly stuck to a don’t-fix-it approach. 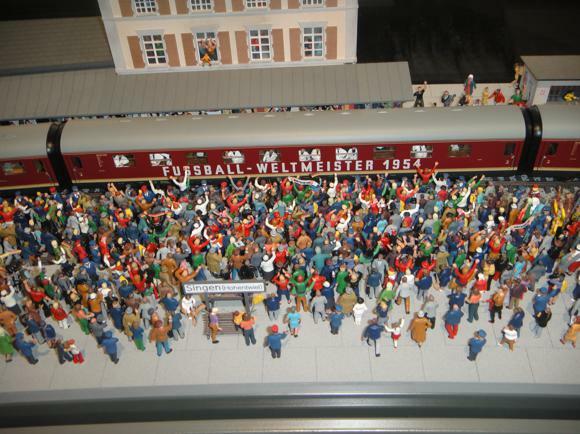 Funded by the profits from the 2006 World Cup, the German Football Museum (Tue-Sun 10am-6pm, last entry 5pm) stands in the perfect location in the perfect city, pretty much opposite Dortmund station. The journey up to the stars, the four stars of Germany’s World Cup victories, starts by escalator that transport you back to 1954, accompanied by an emotive violin rendition of ‘Deutschland Über Alles’. 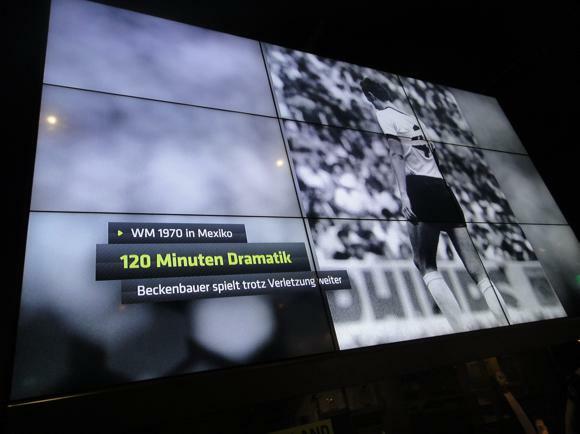 Beside a vast montage of photos from West Germany’s shock victory over Hungary in the rain of Berne, a themed alcove screens a video loop of the match on a television set from the time, commentary (‘Tor! Tor! Tor! Tor!’) provided by the original radio voice of Herbert Zimmerman. 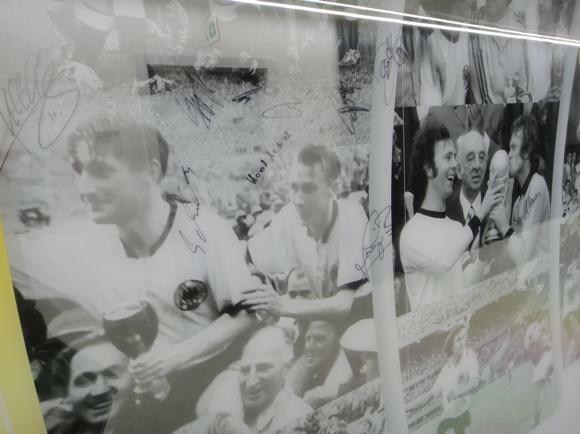 The tour then follows Germany’s 60-year quest for further World Cup and Euro gold. 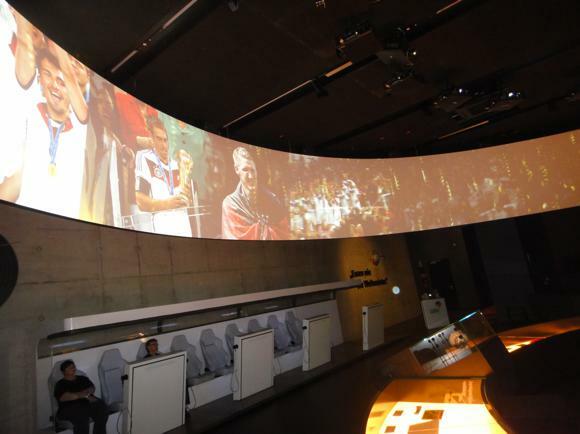 Striking displays include a special feature on the epic semi of 1970 against Italy, an exact model of Rome’s Stadio Olimpico the night of West Germany’s 1990 victory and freeze frames of Gerd Müller’s science-defying turn from the 1974 final. 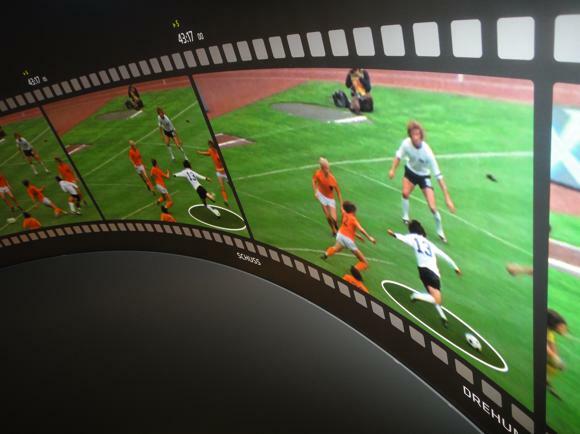 You can also replay the original footage from ’66 and see the ball not cross the line again and again and again. The odyssey ends in glory, of course, and Brazil 2014. The whole climactic installation revolves like a globe, harking back to Sepp Herberger’s famously simple quote from 1954 about the ball being round. Sixty years on, and it’s Jogi Löw’s turn to be philosophical, sharing his conclusions as visions of the whole Brazilian adventure spin by in circular motion around you. In the end, you’re left with a single dressing-room shot of Basti Schweinsteiger cradling his beer, his mobile and a bandage for his face wound, the World Cup just won. 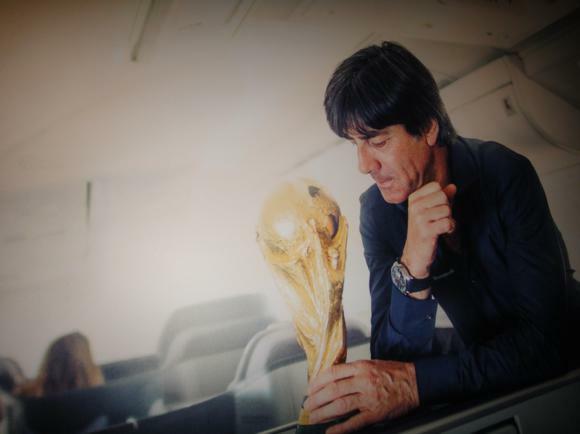 Löw is then seen paternally watching over football’s ultimate prize on the plane from Rio that is bringing him, trophy and team back home to Germany. Journey’s end. 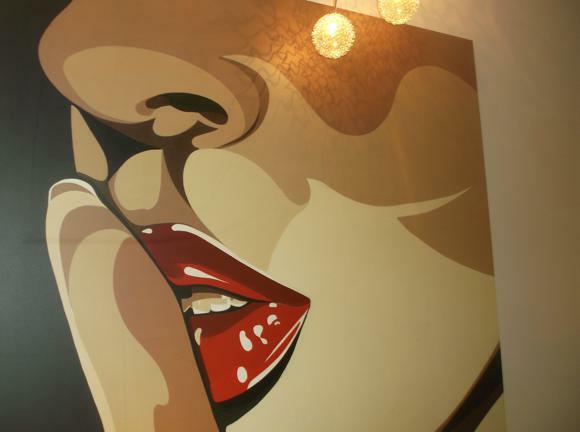 The exploits of the Nationalelf across this whole floor, and elsewhere the history of the women’s team, East Germany, tactics, fan culture, club and cup football, are brought to life with visuals at the forefront. 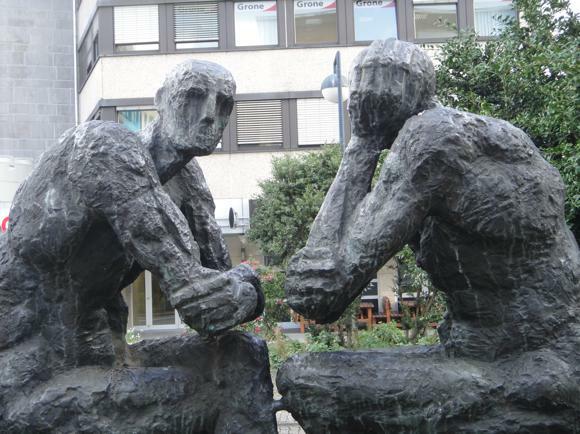 Commentary and occasional captions are in German, but anyone with a reasonable knowledge of the game shouldn’t feel left out for lack of translation. Admission of €17 (€15 online, €14/€12 for under-14s, free under-6s) isn’t cheap but there’s a whole morning’s entertainment here, with several side features and attractions. Sepp Herberger’s reading room is a nice touch. And it’s not every day that you see the match ball from the 1954 World Cup Final.